You are here: Home / Consumer Products / The Perfect Tonic For The Perfect Gin! 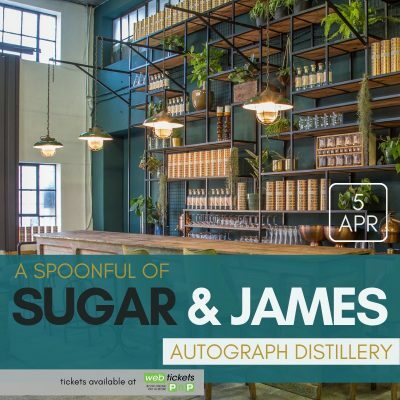 James Stewart and Stephen “Sugar” Segerman will be bringing their exciting new show, ‘A Spoonful Of Sugar And James’, to Autograph Gin’s beautiful home in Stellenbosch on Friday the 5th of April 2019. This innovative, informative and slightly irreverent performance sees the acclaimed South African singer-songwriter, James Stewart, joining Stephen “Sugar” Segerman, the man behind the rediscovery of Sixto Rodriguez and the Oscar-winning documentary, “Searching For Sugar Man”, to share their respective stories and play and sing some great Rodriguez and South African classic songs. ‘A Spoonful Of Sugar And James’ and Autograph Gin are the perfect combination – top class local talent paired with a top class local gin. The beautifully appointed bar and lounge of Autograph Distillery that welcomes guests for tours, tastings and after-hours drinks, reflects Autograph Gin’s signature style – ‘Perfection Distilled’. Autograph Gin, South Africa’s Top Scoring Craft Gin of 2018 will be the drink of choice at this event, with Autograph Distiller Matt Beech on hand to discuss all things gin! An evening not to be missed!